USE A SPICY TEA BLEND TO BRINE YOUR TURKEY. GET CREATIVE WITH GOOD EARTH TURMERIC CHAI TEA AND TURN YOUR THANKSGIVING TURKEY INTO SOMETHING SPECIAL! THAW TURKEY ACCORDING TO DIRECTIONS. USUALLY THE METHOD IS SUBMERGING THE TURKEY IN WATER AND PLACING IT IN THE FRIDGE. WHERE IT WILL TAKE ABOUT 30 MINUTES PER POUND TO THAW. BREW THE TEA AND RESERVE. BRING THE 6 CUPS OF WATER TO A SIMMER, STIRRING UNTIL THE SALT IS DISSOLVED. LET COOL FOR ABOUT 5 MINUTES. PAT YOUR THAWED TURKEY DRY, REMOVE GIBLETS, THEN PLACE IN LARGE BRINING BAG. POUR THE TEA AND SALT WATER MIX OVER THE TURKEY. ADD IN THE CINNAMON STICKS, FENNEL, PEPPERCORNS, HERB BUNDLE, ORANGES, AND ONION. SEAL UP THE BAG AND PLACE IN THE REFRIGERATOR FOR 12-24 HOURS. REMOVE TURKEY FROM BRINING BAG AND DISCARD THE EXCESS BRINE. SAVE THE HERB BUNDLE TO PLACE INSIDE THE TURKEY CAVITY. PLACE TURKEY BREAST SIDE UP IN THE ROASTING PAN. ALLOW TURKEY TO COME TO ROOM TEMPERATURE, THIS TAKES ABOUT AN HOUR. 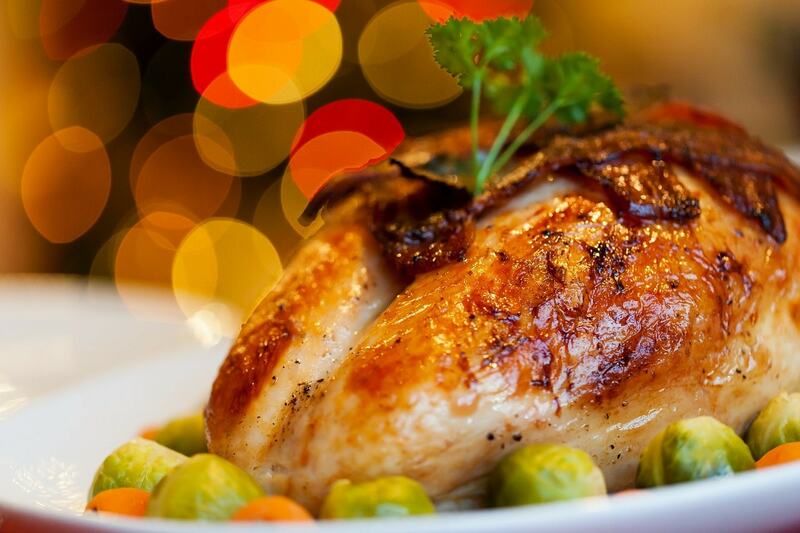 BRUSH THE OUTSIDE OF THE TURKEY WITH 3 TABLESPOONS OF OLIVE OIL. THEN RUB COARSE SALT ON THE OUTSIDE OF THE TURKEY SKIN. POUR THE TEA INTO THE BOTTOM OF THE ROASTING PAN ALONG WITH THE REST OF THE ORANGES AND ONIONS. TRANSFER PAN TO THE OVEN AND ROAST 30 MINUTES. COVER BREAST WITH ALUMINUM FOIL. REDUCE OVEN TEMPERATURE TO 350 DEGREES AND CONTINUE ROASTING UNTIL AN INSTANT-READ THERMOMETER INSERTED IN THE THICKEST PART OF A THIGH REACHES A TEMPERATURE OF 165 DEGREES, ABOUT 1 1/2 TO 2 HOURS MORE. TRANSFER TURKEY TO A CUTTING BOARD TO REST FOR 30 MINUTES BEFORE CARVING. Recipe provided Dina Deleasa of DishItGirl.